When I click "publish" for a post, I never really know who is going to read it. For that matter, when I first started APP, I wondered if, outside of my family, anyone would read it! In ways I never imagined, APP has been a bridge to new opportunities and friendships. That said, sometimes I receive feedback catching me totally off guard. Last week I received an email from Dwier Brown. If Dwier's name doesn't immediately ring a bell, perhaps one of his better roles might: John Kinsella. Yes, that would be John Kinsella, the father to Ray Kinsella, played by Kevin Costner in Field of Dreams. Dwier wrote to thank me for my writings here. 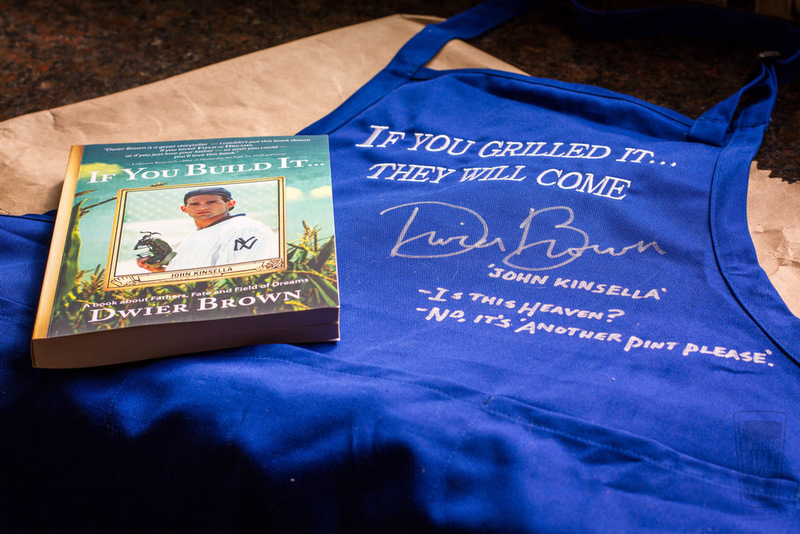 He loves to grill and amazingly found inspiration through my pages. He was incredibly kind enough to reach out and let me know. Besides his career as an actor, Dwier is the author of, If You Build It...A book about Fathers, Fates, and Field of Dreams. Dwier offered to send me a copy as thanks and finished our correspondence querying my choice of favorite colors. A question, he assured me, would be easily understood in a few short days. Several days later a package showed up and as expected, was a copy of his book. What I was not prepared for was this awesome autographed apron. Dwier noted my lack of apron wearing and acknowledged the number of shirts he has personally lost around the grill. He thought I might need some help and had the perfect solution. His observations are correct. I've lost a bunch of shirts and I should wear an apron more often. Unfortunately, his is so nice, I can't bear the thought of staining it. Zoe scooped up Dwier's book the day it arrived and absolutely loved it. I'm looking forward to my turn this week. And yes, when I'm grilling out back, it is my Field of Dreams. It is heaven. Thanks, Dwier!